As with the highly customisable Mad Catz Cyborg M.M.O. 7, there are a number of screws that you can adjust to alter the size and shape of the Mad Catz Cyborg R.A.T. 9 wireless gaming mouse. There are also removable weights for adjusting the weight, and swappable finger and palm rests. This level of customisation puts other gaming mice to shame, and it means that with a bit of tweaking you get a mouse that feels and works exactly the way you want it to. There are plenty of extra buttons to assign to macros for your favourite games, and like gaming mice such as the Logitech Optical Gaming Mouse G400 and the SteelSeries Sensei Pro Grade Laser Mouse, there's a button for instantly adjusting the DPI sensitivity of the mouse, which can prove very useful when gaming. These customisable options makes the Mad Catz Cyborg R.A.T. 9 a rather unique looking device, but it is surprisingly comfortable to use. The major difference with the Mad Catz Cyborg R.A.T. 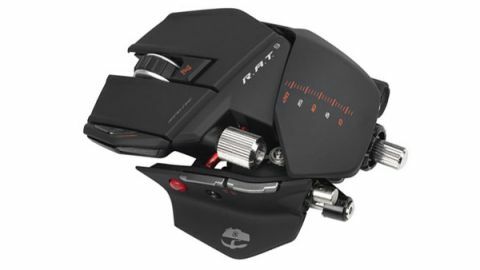 9 compared to Mad Catz's other gaming mice is that the R.A.T. 9 is wireless. While wireless mice have a lot of benefits - especially if you have your gaming PC rigged up to a TV in your front room - they aren't too popular with gamers. One of the reasons is perceived input lag compared to wires, where there is a small yet perceptible delay in the mouse's movement being received by the PC. Better wireless technology has all but eliminated this problem, and we could see no such problems with the Mad Catz Cyborg R.A.T. 9. A more pressing concern for gamers when it comes to wireless mice is battery life. Having a battery die mid-game, and then having to wait for the mouse to recharge, can be a right pain. The Mad Catz Cyborg R.A.T. 9 avoids this problem by having the USB wireless receiver double as a battery charger, and coming with two batteries. This means you can charge one while you play, and when the battery begins to go you can quickly swap batteries, for uninterrupted gaming. It's a nice touch that works well. Overall this is a good, yet very expensive wireless mouse that adapts to your gaming style, and not the other way around.